Jonathan Bluestein of Raynham gets a sample from Linda Spartichino, who operates Homemade Heaven Bakery at the Easton Winter Farmers Market. EASTON — Farmers markets in Massachusetts used to be seasonal affairs, thriving during summer months but becoming as dormant as the crops they sold once the growing season passed. Winter markets have sprouted all over and are enjoying a robust business in Easton, Marshfield, Walpole, and Plymouth, where there are two of them. 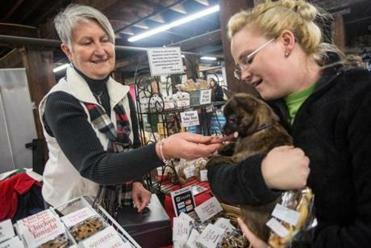 Kathy Varney (left) of Puppy Luv, gives one of her treats to Briana Auclair's dog Gizmo at the Easton Winter Farmers Market at Simpson Spring in Easton. Winter offerings go well beyond fruit and vegetables. Shoppers can buy baked goods, seafood, pasture-fed beef, eggs and cheeses, relishes and salsa, handmade clothing and jewelry, earth-friendly cleaning products, and homemade doggie treats. Some markets even offer knife sharpening for their customers, and at least one has an alternative therapy vendor who provides complimentary foot massages. “This is America, where consumers prefer to have one-stop shopping as much as they can,” Cole said. Public interest in fresh local food is higher than it’s been in about 90 years, and “as long as the demand remains high for local farm products in winter, you’ll see farmers getting into it,” he said. Agricultural extension schools have been showing farmers how to produce in winter, using greenhouses and plastic enclosures called high tunnels. They also focus on crops such as lettuce that can endure low temperatures and dimmer light. 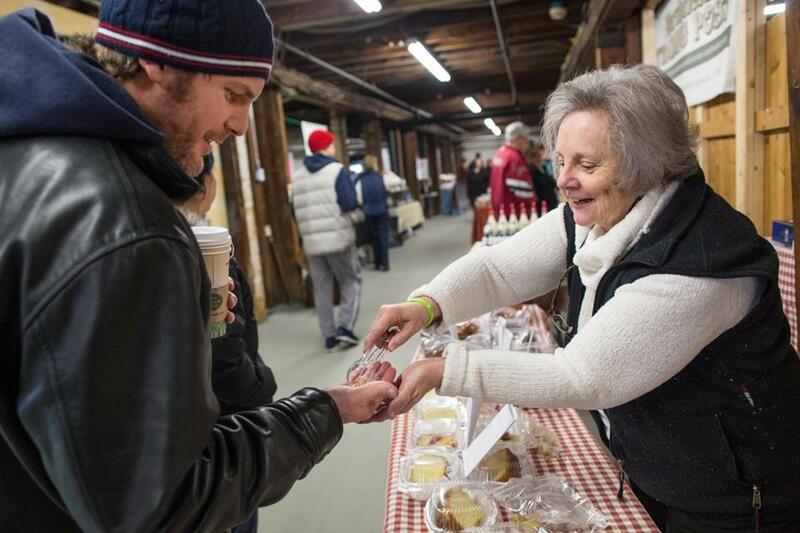 Stoughton resident Paula Gair wouldn’t let a week go by without a trip to the Easton Winter Farmers Market, open from 10 a.m. to 2 p.m. every Saturday in the historic Simpson Spring bottling plant. Sure enough, a short distance away baker Linda Spartichino was dishing out tasty bits of shortbread to prospective customers clustered around her booth. Spartichino does her baking at home, pressing her grandchildren into service as “testers.” She sells her bread and baked goods under the name Homemade Heaven Bakery at the Easton market. 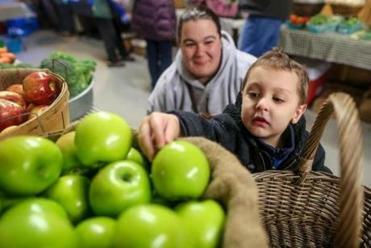 Kathy Trainor (left) of Taunton, watches her son John Trainor 4, choose an apple from the Oakdale Farms stand at the Easton Winter Farmers Market at Simpson Spring in Easton. Easton’s market has a Facebook page with information on events. It can be found at www.facebook.com/eastonwintertimefarmersmarket. Some venues for winter markets often add their own element of interest. In Plymouth, one market operates in the historic Cordage Park rope factory and the other is at Plimoth Plantation. Marshfield’s market is at the Marshfield Fairgrounds, where attendees can check out old farm equipment on display. The Marshfield Winter Farmers Market is in its third year, open from 10 a.m. until 2 p.m. every third Saturday of the month. Market information is at www.marshfieldfair.org. Walpole’s market operates out of the VFW Hall on Robbins Road, from 10 a.m. until 2 p.m., two Sundays a month. Customers can check it out at www.walpolemafarmersmarket.com. A winter market offered by Explore Historic Plymouth Inc. is the only one in the area other than Easton’s that is open weekly, from 3 to 7 p.m. Fridays at Cordage Park. The organization decided to try a winter market after completing a successful first summer season last year. Market news is posted at www.plymouthwinterfarmersmarket.org. Veteran market manager Barbara Anglin has operated her thriving summer Plymouth Farmers Market for about 10 years, and her winter market is in its fourth year, open 2:30 p.m. to 6:30 p.m., one Thursday a month at Plimoth Plantation. The next market, set for March 14, will include some St. Patrick’s Day fun, offering a variety of Irish soda breads and entertainment by The Lindsays, who play contemporary Irish music. Plymouth Farmers Market recently expanded its meat offerings beyond pasture-fed beef and veal. The market’s schedule can be found at www.plymouthfarmersmarket.org.